Competency-based talent management is an approach for managing talent that defines the competencies required for organizational success, and provides a framework for ensuring employees are hired, developed, promoted and generally managed according to these competencies. Prior to launching your competency initiative, it is important to establish a competency architecture that will work for your organization. It should include all the competencies that employees need, now and in the near future, to ensure your organization can achieve its vision and support its values. It should support all of the intended uses of the competencies (e.g., recruitment and selection; learning and development; performance management; and career development). Core Competencies: These are general competencies that all employees must possess to enable your organization to achieve its mandate and vision. They describe in behavioral terms the key values of your organization and represent organizational strengths that help your organization differentiate itself from its competitors. Job Family Competencies: These are competencies shared by a “family” of functionally related jobs. A Job Family is a group of jobs that have common functions / duties and form a logical group for acquiring resources and managing careers. They can include jobs within a specific functional area of the organization (e.g., Finance Department) or they can incorporate groups of jobs across functional areas (e.g., Administrative jobs distributed throughout the organization). Job Family Competencies describe those competencies that are common for jobs within a particular job family, and can include both General as well as Technical Competencies. For example, specific Technical Competencies for Accounting could be incorporated for all jobs in a Financial Administration job family, as well as some of the General Competencies (e.g., Analytical Thinking; Attention to Detail). Job Specific Competencies: These are competencies needed to perform effectively in a specific role or subset of roles beyond those included in the set Job Family Competencies. Once again, these can include both Technical and General Competencies, but most often include specific Technical Competencies needed for effective performance in a job or role. For example, Auditing may be needed only in a subset of jobs in a Financial Administration Job Family. Leadership Competencies: These are competencies required of the leadership levels of the organization. They define the leadership requirements to achieve the vision, values and strategic direction of the organization. They can be defined as a job family or form a separate layer in the architecture. The image below illustrates how a competency architecture can be built on the vision, values and strategic priorities of your organization. What is the basic structure of your competency architecture? What end uses will your competency architecture support – e.g., learning and development; recruitment & selection; etc.? Will there be a set of core competencies? If so, how will they be identified? What are the distinct job families and job groups? 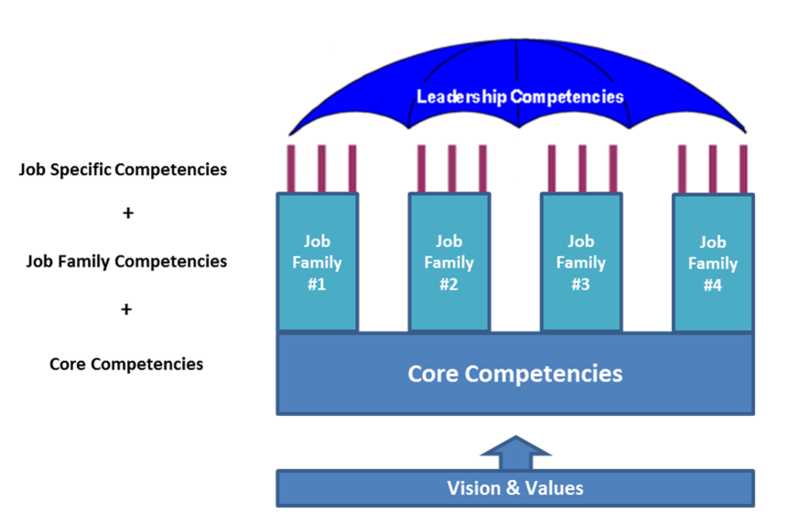 How will you treat leadership competencies – will they be embedded in each Job Competency Profile, or will they be treated as a separate set of competencies needed by leaders within the organization? Competencies have many potential applications, including: recruitment and selection; learning and assessment; performance management; career development and succession management; and human resource planning. As noted in the previous section, the way in which the competencies will be used will influence your competency architecture – for example, career development and succession management are more easily supported by competencies that incorporate proficiency levels or scales, such as those in the CompetencyCore libraries of General and Technical Competencies. In this way, jobs can be mapped in terms of the levels of proficiency needed for each competency. As an example, a Help Desk Agent may need to display the behaviors shown at Level 3 proficiency on the Client Focus competency scale whereas an executive responsible for setting service standards and ensuring quality service delivery would need Level 5 behaviors on the same competency. Proficiency scales help you compare requirements across jobs, which is especially useful when determining potential career paths within the organization. How will competencies be used in the short and long term - e.g., recruitment and selection; learning and assessment; performance management, etc.? Which will be the first application? Will there be a staged approach to implementation? If so, which job group or job level will go first? To what extent will managers and employees need training? Building from the Competency Architecture, the next blog in this series describes the steps and process for developing job competency profiles / models. The next blog in this series will describe steps and process for developing job competency profiles / models. Sign up to our blog’s mailing list through the form on the right-hand side to receive the rest of the series in your inbox. Seems effective and handy process document for HR practioners. I suggest we must also discuss the proficiency levels along with each competency. Competency for a particular function might be same but its application would vary for each role/level in the same function. We can elaborate on this.